During the last Ice Age, North America was sculpted by massive glaciers resulting in craters formed by retreating (melting) ice. During that process the Great Lakes were born and the state of Michigan took shape. Europeans began exploring the area in the 1600's. The first white explorer to the area was Frenchman Etienne Brule in 1620 under orders of Samuel de Champlain. 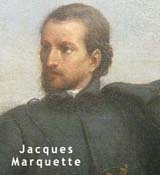 In 1668, French missionary Jacques Marquette established the first permanent settlement in Sault Ste. Marie. The French continued to build trading posts; forts and villages throughout Michigan, including Fort Ponchartrain du Detroit, now present day Detroit. Territorial disputes between the British and French contributed to the start of the French and Indian War. With the Treaty of 1763, France ceded all of (future) Michigan to the British. The British included Michigan as part of Quebec in 1774. The Treaty of Paris, which ended the Revolutionary War in 1783, included the British ceding Michigan to the United States. 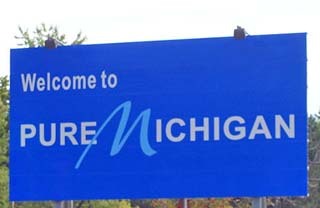 Michigan first became part of the Northwest Territory , then the Michigan Territory until its admission to the Union as the 26th state on January 26, 1837. The growth of Michigan after its statehood was rapid, as immigrants from Germany, Ireland and The Netherlands arrived to assist with the construction of railroads, roads and canals plus the expansion of the lumbering industry. Following the invention of the automobile, the automotive industry in Michigan exploded with the establishment of the Ford Motor Company, General Motors and Chrysler mass-production plants. Race riots in 1967 shook the city of Detroit. As a result, 43 people were killed, hundreds injured and more than 2,000 buildings destroyed causing over $200 million in damages. 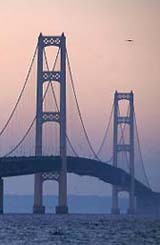 Bordered by four of the five fresh water Great Lakes, Michigan is divided into two peninsulas, Upper and Lower, which are joined together by the Mackinac (Big Mac) suspension bridge, spanning the Straits of Mackinac. Michigan's dependence on the auto industry has caused the state to have one of the highest unemployment rates in the country. In the recession of the 1980's, factories were closed when car sales slumped. In the 1990's, recession and foreign competition resulted in the layoffs of thousands of Michigan workers. Although the recession of the 21st century has caused additional job losses, Michigan has diversified its economic base and is home to other major industries including cereal products, pizza, information technology, aerospace and mining. Michigan is currently the third largest grower of Christmas trees in the U.S. It ranks fourth in the nation in high tech employment. 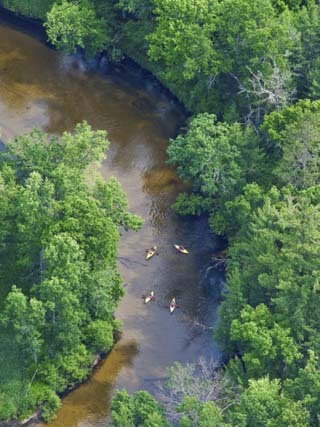 Michigan ranks high in tourism with vacationers, hunters and fishermen drawn to its forests, lakes, thousands of miles of beaches, golf courses and snow activities. 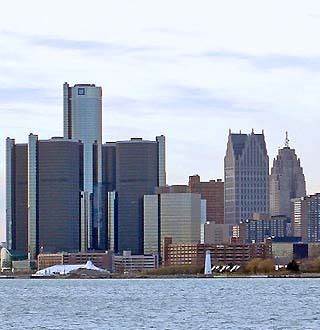 Detroit, the largest city, offers museums, arts, sports and gambling. The Upper Peninsula is a beautiful, rugged, sparsely populated place, where severe winters are commonplace. Small towns, large cities and fertile farmland in all directions dot the Lower Peninsula, home to most of the people. The shorelines of Michigan are covered by over 115 lighthouses - their mission is to warn mariners of possible danger. They are also reminders of the state's vital relationship with the Great Lakes.